Brazzaville (Agenzia Fides) - "The Church in the Republic of Congo was founded 135 years ago by the French missionaries of the Congregation of the Holy Spirit who arrived in Brazzaville in 1880. Since then the Church has taken root all over the Country. Everywhere there are churches and parishes, and above all communities full of faithful": says in an interview with Agenzia Fides Fr. Armand Brice Ibombo, Secretary General of the Episcopal Conference of Congo (Congo Brazzaville). "The challenges we face as a Church are manifold: firstly, there is the formation of the laity in understanding the doctrine of the Church and in explaining the hope of their faith, as St. Peter says. In this way the laity can deal with the so-called 'Churches of awakening', those of Pentecostal origin, and the real religious sects that proliferate throughout Congo and do not havea good opinion of the Catholic Church", explains Fr. Armand." These churches do everything to attract the faithful, with material goods, often financed from abroad, from the United States in particular; many of their Pastors come from outside our Country", underlines the Secretary General of the Episcopal Conference. There are Churches of local origin that draw resources from the population with the promise of future benefits, exploiting the credulity of the poor", he adds. Fr. Ibombo says that "in addition to the evangelical and Pentecostal churches, the Islamic religion is spreading in the Republic of Congo, similar to the 'churches of awakening', through the collection of economic aid especially towards young people. Some offer the possibility of opening a business start-up, while others offer the opportunity to go and train in an Arab country". According to Fr. Armand, "for some time we have noticed a small increase of Congolese teenagers who have become Muslims and bear witness to their new faith by wearing Islamic clothes. At the moment there are no problems. But we also have the infiltration of extremists in our country. Congo borders with the Central African Republic where there are Islamist groups like Seleka. 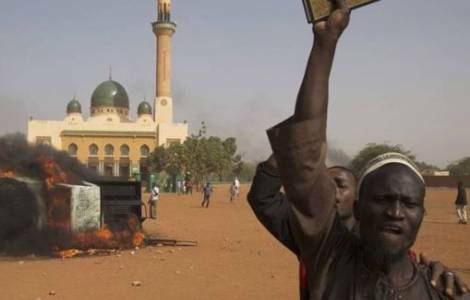 Central Africa borders with Cameroon where there are the Nigerian Islamists of Boko Haram"
"To face these challenges in addition to the formation of the laity, we need to focus on the education of young people", emphasizes the Secretary. "Our students need to be formed not only culturally but also spiritually, with Christian and human values, as the Social Doctrine of the Church urges us. If we want to have a future of peace in our Country, this also depends on our commitment to our young people".